My moment to remember sadly was last year! the build up had been going for years! i used to have a work out dvd and there on it was the bid for the event! the music the sport it made me cry every time i saw it! ok you got me our moment was going to the paralympics last summer! i recently tried to watch the Olympic opening ceremony again but was balling my eyes out! had to turn it off! im not really a sports fan but maybe it was the unity or that it wasn't that far away! i loved last summer (Also Ami was born too). i was gutted not to get along to any Olympic events but my husband didn't think it would be a good idea being 40 weeks pregnant! i suppose Ami was an Olympic baby born right in the middle! so i thought if i couldn't go along to the Olympics i get along to the paralympics! i wanted Pants to see the Olympic stadium and experience the Olympic park! i was fortunate to get the tickets before the Olympics as suddenly everyone wanted tickets! so the time came Ami was five weeks so we stay at a friends the night before who lives nearer London! So we get up early ready with everything for the day! fortunately i was breast feeding so Ami was still in that time where she was easily maintained! finally head into the station meeting and actually talking to people on the tube (unheard of in London). There was tons of people and everyone was excited for the event they were going to see! we walk towards the park i was holding back the tears! it was such fun! the weather was sunny i think it was going to be one of the hottest days of the year (wasnt hard during last years year of rain)! we queue up to get in pour all our water and fluid as was only aloud to take 100ml in! then drop the pushchair in the buggy park and make our way up to row 143. Finally the event starts its all exciting stuff happening everywhere and it was so much fun! alot of applause and mexcian waves Pants was very excited! we were sitting in the shade so we wernt too hot! although the whole time we were there there was only two athletes from the united kingdom but it was still good! a good memory and will never forget going along! even if it did include a long wait just to go into mcdonnalds! 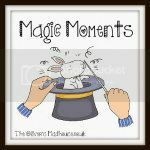 What a cracking magic moment, i would of loved to go and watch i think its really probably is a one in a life time thing for most.